If you love to bake or love sweets, Cupcake Checks are perfect for you! These cute and fun Cupcake Checks will make you smile and dig out the baking supplies to make your own cupcake creations. 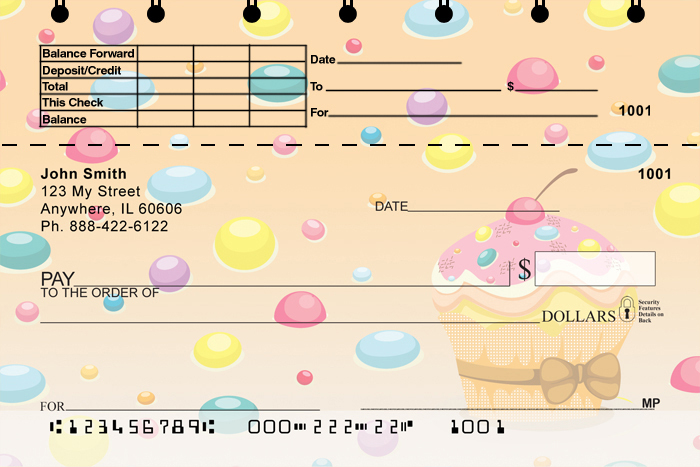 If you love to bake or love sweets, Cupcake Top Stub Personal Checks are perfect for you! These cute and fun Cupcake Checks will make you smile and dig out the baking supplies to make your own cupcake creations. Make your checks stand out with Jen Goode's Cupcake Checks. These checks feature four rotating images of stylistic cupcakes. As always, these checks are available at our everyday low prices. Don't forget to purchase your matching address labels!